One of the things that we love about the business that we are in, is that it gives us the opportunity to work and collaborate with all types of clients including interior designers, landscape designers, architects, private residences, commercial clients and more. We can supply a small home, or a grand resort with exactly what they need. And when we work with designers, it is our goal to make it as easy as possible for them to complete their outdoor projects from beginning to end. The designers that work with us trust us, and we respect what they do. Whether they are local or national, we get to know them, and we work with them over and over again. Every year we travel the world searching for the best of the best in outdoor furniture. Our designers collaborate with furniture designers in Italy, Belgium, France, Indonesia, Vietnam, and the Philippines to bring our clients an unbelievable selection. We stay on top of trends and we are able to predict what new styles will be successful, this way designers are able to successfully finish their projects with amazing pieces that are bold and fresh. One of the most important aspects of our business is that we have the stock available and we are able to deliver it quickly locally or nationally. With over 125,000 square feet of warehouse space, we know that we can pull the products that our clients need. Whether it is a single wicker chair for a private home, or 50 dining chairs for a restaurant. There is always an exciting flurry of activity at our distribution center. We have an amazing warehouse team that is constantly receiving new stock, and prepping stock for large shipments. Our builders have years of experience and expertly assemble products here in the U.S.A. Every piece is inspected and quality controlled before it goes out for delivery. Another reason why designers love shopping with us is because all of our deep seating pieces come with Sunbrella® cushions as shown on our website. This includes our a-grade teak deep seating furniture. You will notice that most of the time other furniture stores will only sell you the outdoor furniture frame. Or they will offer cushions but at an additional charge. Not only is this expensive, it is more time consuming and frustrating. 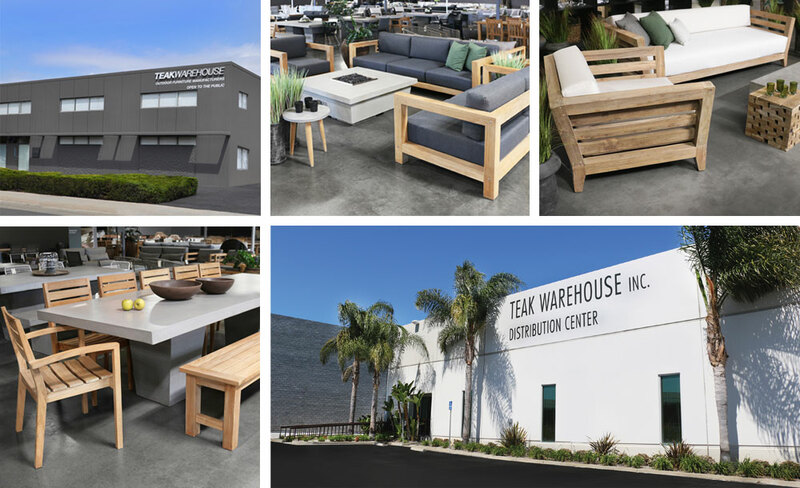 At Teak Warehouse we include beautifully tailored Sunbrella® cushions with the deep seating purchase. We have a large selection of amazing colors including rich colors like charcoal and granite. It is important to only use Sunbrella® fabrics for outdoor cushions. This is another reason why it is beneficial and convenient for designers to shop with us. Everything begins at our headquarters. We have an extremely talented sales staff that personally works one-on-one with designers. Whether all communication is done over email, phone calls, or in our showroom. From the beginning to the end of the project we are there to make the sure the process is seamless. We can recommend styles that are modern, mid-century, traditional, chic, sophisticated, or rustic. We can offer solutions for small or large spaces. Everything is discussed so that our designers can feel confident they have what they need to successfully finish their project. And don’t forget the shipping! We coordinate white glove shipping locally and nationally. Designers can rest easy knowing everything will fall perfectly into place. Every detail is considered down to the last throw pillow, all fully assembled and ready to position in your garden. We feel extremely fortunate and grateful to be able to work with designers and supply them with the highest quality and most luxurious outdoor products. These collaborations and projects are exciting and it is very rewarding to see the successful completed projects. We have been doing this for over 25 and we look forward to helping all of our clients create their dream outdoor spaces for many many years to come. Our designers love us and we love them!